Let Your Spirit Go Commando! I had sent an email to some friends yesterday. It was a quote about dressing in one’s spiritual best by washing yourself in the morning with blissful energy rather that water. To imagine that your garments were divine robes rather than day clothes. I added a comment to the quote that rather than “preparing for a crash” (with clean underwear) we prepare for the day living in the divine energy of our true selves and the light of our Higher Power. What could go wrong with such a reframing of our morning ablutions: to prepare for living in the light, rather than preparing for an accident? Well, alert reader DF (you know who you are) fired back an email that made me laugh out loud: “So.. should I go commando?” After ruminating on this comment all day I thought “heck yea!” we should all be in spiritual commando! Let go of roles, let go of the masks, let go of the shields that separate us from one another and that keep us hidden from our true self. So, yes, take a spiritual bath in the morning, washing away any leftovers from the day or night before (saucha). Adorn yourself in your best garments of all the yamas and the niyamas, and go out into the day- naked, but for your true self. 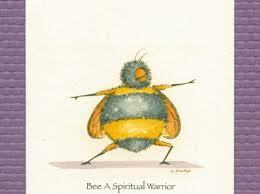 Yes, you spiritual warriors, Go Commando!